Jigme Lingpa was the incarnation of both King Trisong Detsun and Vimalamitra. 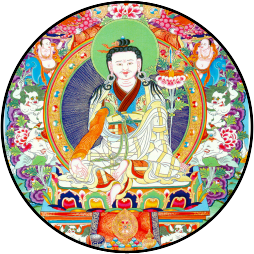 He discovered the teachings of the Longchen Nyingthig as mind ter. He was born to a family of simple means in Southern Tibet. At the age of six, he entered Palri Monastery as a novice monk. He was not an extraordinary student and was largely overlooked. However, his uncommon devotion to Guru Rinpoche and his naturally arising compassion for all sentient beings, especially animals, provided the foundations for a very meaningful early spiritual life. Jigme Lingpa was not a great scholar in his early years. Still, he absorbed knowledge and learning easily, mastering difficult subjects sometimes by merely glancing at texts. At the age of thirteen he became the student of the great Terton Rigdzin Thukchok, from who he received many transmissions and empowerments. At the age of twenty-eight, Jigme Lingpa began a three-year strict retreat at Palri Monastery. It was during this time he discovered the cycle of Longchen Nyingthig teachings. For the disciples with pure mind, You are Trisong Detsen. For the disciples of impure mind, You are Senge Repa. This is Samantrabhdra's mind treasure, The symbolic scripts of Rigdzin Padmasambhava, and The great secret treasures of the dakinis. Signs are over! The dakini disappeared and Jigme Lingpa opened the casket with great joy. He found that he could read the scrolls contained there. He swallowed them so that the words and realization became inscribed in his mind. He kept the teachings secret for the next seven years until he had mastered all of the practices described therein. Then he began to teach. For the remainder of his life he lived a life teaching and retreat at his simple cave in Tsering Jong. There, he beheld many visions of Longchen Rabjam and received teachings and transmissions directly from him.